The project page contains a bunch of examples, from easy ones to some more complicated uses. Feel free to contribute more examples! 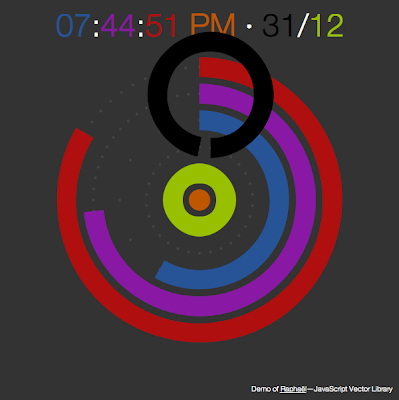 gives me Polar Clock, one notable example from RaphaelJS. Make sure you check out other examples, such as getting weather forecast conditions, finding pizza in New York, looking up approximate location based on IP address, pulling the list of seasonal food, displaying tweets, and many others. Headless execution of any web content also enables fast unit testing. Obviously, the goal is not to replace comprehensive, cross-browser framework such as Selenium or Squish for Web. Rather, it serves a quick sanity check just before you check in some changes. Since this can happen automatically and does not need to launch any browser, even better, you can hook the test so that it executes right before a commit and actually prevents the commit if any of the test fails. It is easily done using git via its hook support. This is something I have written at Sencha blog. It demonstrated precommit hook with Jasmine, but technically it can work with any test framework. I have been working on and off on PhantomJS for the past few years. You may be already familiar with some of its inspiration (also involving headless WebKit): SVG rasterizer, page capture, visual Google, etc. Finally I managed to overcome my laziness, cleaned up the code, and published it for your pleasure. Obviously it's not a surprise if you find out that PhantomJS uses QtWebKit. I got a few tasks for next PhantomJS version 1.1. You are encouraged to file bugs and feature requests in the said issue tracker. This is just great, thanks a lot for this project. Really cool project. Can the Windows executable downloaded from the project website be redistributed with a commercial application? What are the conditions for this? @Tommy: I am not a lawyer so I'm not sure about that. WebKit is using GNU LGPL, PhantomJS itself is BSD licensed, and the executable is statically compiled. You may want to consult knowledgable IP attorney. This is cool! However, the fact that the entire script gets cleared and re-executed after a call to "open" seems kind of funky. Wouldn't a callback be a little more straightforward? I could see this getting really convoluted for a multi-page scenario. These things are always more complicated than they seem. I grabbed the windows binary but can't get examples which use phantom.open() to run. Other examples do work, so webkit is clearly working, but do I need to get the rest of Qt as well? Addendum to my last comment: I forgot that I have to use a proxy here. If it doesn't automatically detect and use the default system proxy settings is there a way to set the settings manually? @GVN: The re-execution is not a design choice, it's a workaround to the technical limitation. Essentially the script runs in a context of a web page, so it's thrown away after another page is loaded. Do I use this with proxy server? @Danii @Matt: it seems that phantomjs can't (yet) detect a configured http proxy. Unfortunately, there is no command line argument to specify one either. Ariya, could you update the Wiki FAQ with this information? This is a great project. Do you have any intention of supporting plug-ins ... specifically Flash? Firstly this looks amazing. Have had a quick play (with render() in particular) and it's great. One question: does the implementation work with cookies? i.e. I've got a script which loads a login page, fills in the form and then clicks the button (all good.) This then returns a new page (it is logged in) but then once I attempt to go to another page it redirects back to the login page. I'm using asp.net but I doubt that matters. @David Connors: Flash is tricky because most of the time it is a windowed plugin and thus it requires some view (can't be headless). @MarkJ: I'm fairly sure that cookies support is missing. Great work, i can imagine this becoming a part of my testing setup. @Husky: Check the roadmap wiki page.